PACKAGE THIS TITLE WITH OUR 2016 MLA SUPPLEMENT, Documenting Sources in MLA Style (package ISBN-13: 9781319087326). Get the most recent updates on MLA citation in a convenient, 40-page resource based on The MLA Handbook, 8th Edition, with plenty of models. Browse our catalog or contact your representative for a full listing of updated titles and packages, or to request a custom ISBN. 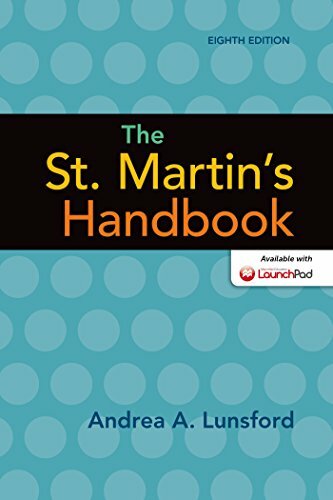 Andrea Lunsford’s comprehensive advice in The St. Martin’s Handbook, Eighth Edition, supports students as they move from informal, social writing to both effective academic writing and to writing that can change the world. Based on Andrea’s groundbreaking research on the literacy revolution, this teachable handbook shows students how to reflect on the writing skills they already have and put them to use both in traditional academic work and in multimodal projects like blog posts, websites, and presentations. Integrated advice on U.S. academic genres and language follows best practices for helping students from both international and native-speaker backgrounds improve their understanding of academic English. Throughout The St. Martin’s Handbook, Andrea Lunsford encourages all of today’s students to learn everything they need to communicate effectively with the diverse people sharing their classrooms, workspaces, and civic lives.